Steven, as someone who has recently written research on entrepreneurship and been part of an entrepreneurial process, I think that your analysis is spot on. I don’t think I have seen any literature make the clear distinctions you have done here. I think that a “process” view is fundamental to understanding what really is going on for the entrepreneur. Slides look great, and I love that you’re emphasizing the distinction between startup small businesses and scalable startups. I also agree with Avron that there are ideas here that are new to the academic community studying entrepreneurship, although the work of the New Institutional Economics community is in many places complementary. Nate Rosenberg at Stanford, in particular, has been doing related work for decades. One small, but important, comment: Since scalable startups need to keep books in addition to tracking metrics, and since growing large companies ought to track metrics in addition to keeping books, I would hope that the point is made that it isn’t either/or, but rather where the emphasis and focus should be. Having spent some time studying financial statements from public companies, it’s a continual frustration that the public reporting makes it very difficult to backout the metrics that really tell you whether it’s a growing company or not. 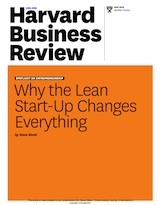 Elsewhere I have argued that one of lean accounting and management theory’s big conceptual contributions is to emphasize frequency-averaged measures of revenue and cashflow, such as turnover ratios. Electrical engineers can appreciate how useful it is to see the spectrum for your signal, since lots of important information can be hidden in a time series, much less a time average like what you get in your income and cashflow statements. apple prevents me from watching and learning from your talk. I’m on my iPhone. turns out their anti-competitive behavior inhibits startups. Intrigued by your idea of ‘customer development’. This implies that the customer is changing. If it’s the startup that is changing to match the customer’s needs, how about ‘customer discovery’? Slide # 20. Amazing. Thanks for posting. I am from a small business. Great slides that will make me think about how to start the next one as a scalable startup. 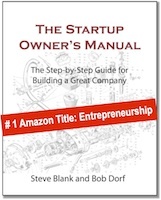 “entrepreneurship school” – love it! I’ve been reading your blog for a while (well, pretty much since you started it) and have seen these ideas publicly gel over that time via your comments and posts. The current presentation does a great job of encapsulating much of what you’ve been saying. I think you’ve really hit it with this. The earlier slides in the deck on hypothesis testing, getting out of the building, and pivoting can still use some refinement. The concept of what a search for a biz model entails is there, but it’s not nearly as refined as the rest of the deck. Obviously, the slides support the talk and are difficult to take stand-alone, but just taking them at face value, I like how the later slides bring the concepts together better than the earlier. Either way, great deck. Steve, looking forward to “seeing” (via simulcast in Boston) your presentation live on Friday. Steve, this is a wonderful presentation, but I’m a little confused about something. The question of process within startups seems to be a contentious one. For example, Eric Ries recently wrote a piece for the Harvard Business Review about how much process is needed for a startup. 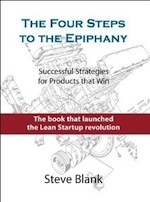 In the article he wrote, “building a great product depends on [startups developing some kind of process]”. He also makes the point that the amount of process should only be the amount *needed* to keep learning (which isn’t very much). This is a little at odds with page 34 of your slide, where you write that a CEO of a scalable startup “hates and eliminates” process. Is this just hyperbole you used to illustrate your point, or is Eric Ries wrong to suggest that startups DO need some process? Thanks for any clarification (sorry if I’m being dumb). just saw your presentation on the simulcast, it was great, loved it’s clear vision. Is there any recording of it ? I want to roll it out to the local Computer Science department, hope they will be as excited as me. Slideshare.net seems no longet to be sharing your presentation. I’ve read about it, but cannot get to the slides. Can you help?